Welcome to the WWI and WWII Propaganda Posters website. This site has been around on the Internet, in one way or another, since early 1995. It was originally started as a companion to an undergraduate research project on propaganda at the University of California, San Diego (UCSD). At UCSD, it received over 6000 visitors – quite a large number for the early days of the Internet – and it was even selected as a “Yahoo! Cool Site of the Day” sometime in March 1996, an honor in those days. 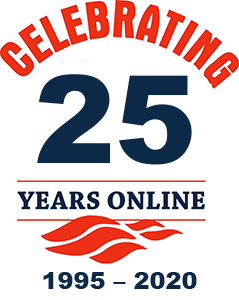 The site was eventually moved to a website donated by Open Storage Solutions in the summer of 1996. After six years there, and over half a million visitors, the site moved from one free service provider to another until landing on our own domain name in 2004. Over the years, we have served countless students and other interested parties looking for these images of America’s wartime past. We are happy to field inquiries from students doing research projects, please contact us at info@propagandaposters.us. We do not sell original copies of these posters. If you are looking for original collectible propaganda posters, you might want to try Vintage Poster Works, where Debra Clifford has been selling authentic original vintage posters since 1991. If you are a teacher working on lesson plans that touch on war propaganda or other propaganda-related topics, you may wish to visit our Educator Resources page to find links to lessons and other helpful things. Thank you for visiting – enjoy your time here.